Kokanee Salmon are bright silvery fish with no definitive spotting pattern. Kokanee have a dark blue back with silvery sides. 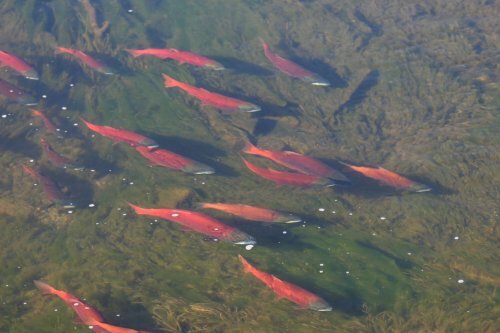 As the spawning season approaches, kokanee turn from silver to orange to deep red and the male develops a characteristic hook-jaw common to the Pacific salmon. A deeply forked tail also distinguishes them from rainbow, cutthroat and brown trout. They are present in reservoirs such as Flaming Gorge, Porcupine and Strawberry reservoirs. Kokanee Salmon is simply the name for a Pacific Sockeye Salmon when it is landlocked. Kokanees have been a part of Utah's fishery management program for many years now. Kokanee can be one of the most difficult and elusive fish species to catch in Utah, but are a beautiful fish to catch and are very tasty to eat.